Hiring in May closely tracked the year-long trend of steady, though unremarkable growth in payrolls. The private sector continues to show considerable resiliency in the face of government spending cuts, political gridlock in Washington and difficulties in Europe. With the stock market rising and the housing market on the upswing, consumers continue to spend and maintain a confident outlook. The recovery in housing is building at a time when some segments of manufacturing are losing momentum, and home sales and development will take the reins a major engine of economic expansion in the coming months. Employers added 175,000 jobs in May, led by a gain of 178,000 positions in the private sector, on par with the average over the last 12 months. 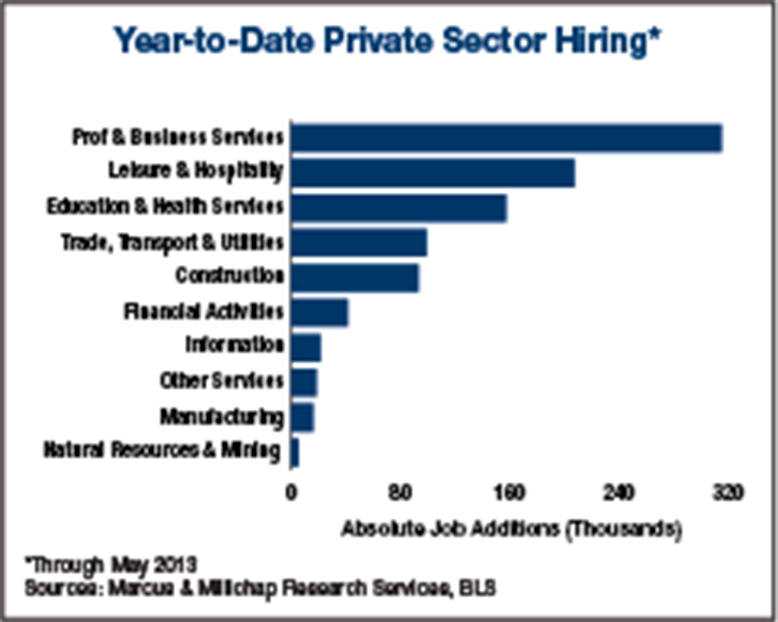 Nine of 10 private-employment sectors added workers last month, with gains concentrated primarily in professional and business services, and trade, transportation and utilities. Retailers added nearly 28,000 jobs in May as improving home sales and home building fueled higher spending on furnishings and building materials. Leisure and hospitality employers created 43,000 positions last month, mostly at bars and restaurants. Hotels trimmed 4,800 jobs in May, though higher occupancy has supported a gain of nearly 11,000 jobs year to date. The recovering housing sector is reaching into several segments of the job market. Residential contractors added only 900 positions last month, but payrolls have grown by 16,200 jobs year to date. Home sales are also strengthening the finances of local governments, which added 13,000 workers in May and 19,000 spots so far this year. Housing’s momentum occurs as manufacturing, which drove the early stages of the recovery, has started to sputter. The nation’s factories trimmed 8,000 positions last month, the only private-employment sector to cut workers. Auto manufacturing, however, remains a bright spot. Transportation equipment manufacturing payrolls inched up last month and auto makers reported higher sales earlier this week. An 11 percent rise in light truck sales can be partly attributed to the revival in home building. Following the addition of 38,400 workers last month and a downward revision to April payrolls, full-time, office-using employment remains just 2 percent from pre-recession peak levels. Through the first four months of 2013, more than 266,000 full-time office positions have been added nationally, accounting for more than one-fourth of all private-sector jobs created during that time. Growth in full-time office jobs has helped reduce the amount of under-utilized space and raises the probability that employers will expand their office footprints to accommodate additional workers. This year, office tenants will absorb 98.3 million square feet of space to drive down vacancy 80 basis points to 15.9 percent. The gains in retail employment this year arose not only from higher customer traffic, but also from the opening of new stores. More than 4 million square feet of space was absorbed in the first quarter, trimming vacancy at the nation’s shopping centers 10 basis points to 10.7 percent in the first quarter. Nominal construction, additional store openings, and the traffic and spending generated by a strengthening job market will tighten vacancy by 80 basis points this year to 10.0 percent and support 1.8 percent asking rent gains. This entry was written by marcusmillichap, posted on June 7, 2013 at 10:38 pm, filed under Uncategorized and tagged Commercial Real Estate, Employment. Bookmark the permalink. Follow any comments here with the RSS feed for this post. Trackbacks are closed, but you can post a comment. Your reports are clean, easy to understand, and quickly give me the information I am after so I can move on. They always confirm the market trends I am looking at and seem to be right on! I am active in competing real estate markets and I need to know how other sectors are doing and your reports accomplish that. I’ve been reading your site for a long time now and finally got the courage to go ahead and give you a shout out! Just wanted to tell you keep up the excellent work!